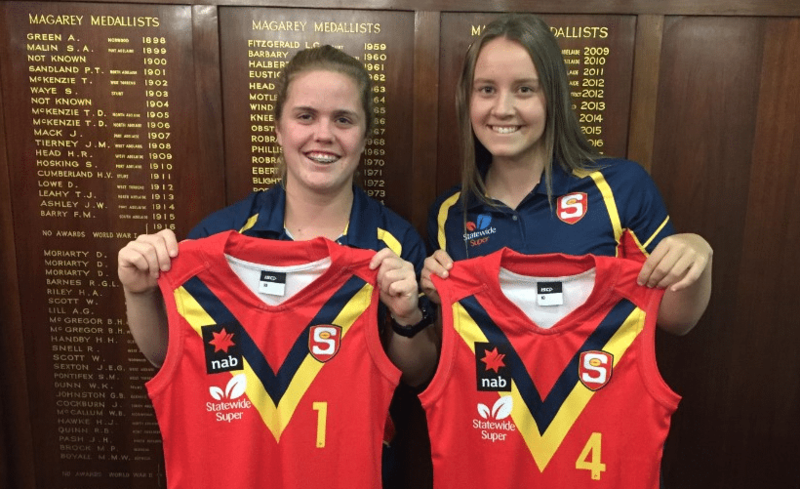 SOUTH Australian forward, Katelyn Rosenzweig has always dreamed of pulling on an Adelaide Crows jumper. Ever since she filled in for her local Under 11 boys side, the 18 year-old has not looked back, and is taking every opportunity she can to achieve every young footballer’s ultimate dream. She was always determined even as a young Under 11s player, as she describes her initial discovery of the sport. Not only has she been pulling on the guernsey for many years, the young forward has achieved monumental milestones in it too. Just last month, Rosenzweig was kicking goals for the Central Allies side in the AFL Women’s Under 18 Championships, and was named in the 48-player All Australian squad for her efforts inside 50. She said she was thrilled to have received the opportunity to represent the dual-state side. Kicking goals is not something the 18 year-old has always being accustomed to, admitting that she spent her junior years at the other end of the ground. This year, Rosenzweig dominated the goal kicking for her SANFL Statewide Super Women’s team, North Adelaide. She kicked 15 goals from 11 games, four majors clear of Greater Western Sydney (GWS) midfielder, Courtney Gum, who finished in second place. The forward admits that this is a memorable moment for her in her football career. Rosenzweig has also improved in other areas of her game to complement her goal kicking, but is still set on improving her all-round game in order to pull on that coveted AFLW jumper. “I’ve been told my marking ability and obviously my kick’s pretty good but definitely need to get fitter and maybe just read the play a bit earlier than I have been lately,” she said. Playing against bigger bodies is something that Rosenzweig has had experience in, as she moved straight into a senior women’s side after finishing off playing with the boys. “When I stopped playing, they just brought a team to Angle Vale for girls but I had to play with the senior women and get a permit to play up because I was too young,” she said. 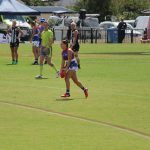 Just last week, Rosenzweig experienced a similar feeling, running out with the NT Thunder in its Round 12 Victorian Football League (VFL) Women’s match against Casey. The 18 year-old got on the board with two goals and also racked up 14 disposals as well as five marks in the historic clash in Alice Springs. Highly committed to her craft, Rosenzweig travels about an hour and a half from school to football, and only rests on Monday and Fridays. With this commitment instilled on her, Rosenzweig is on the right path to achieving her lifelong dream to play Australian Rules football. 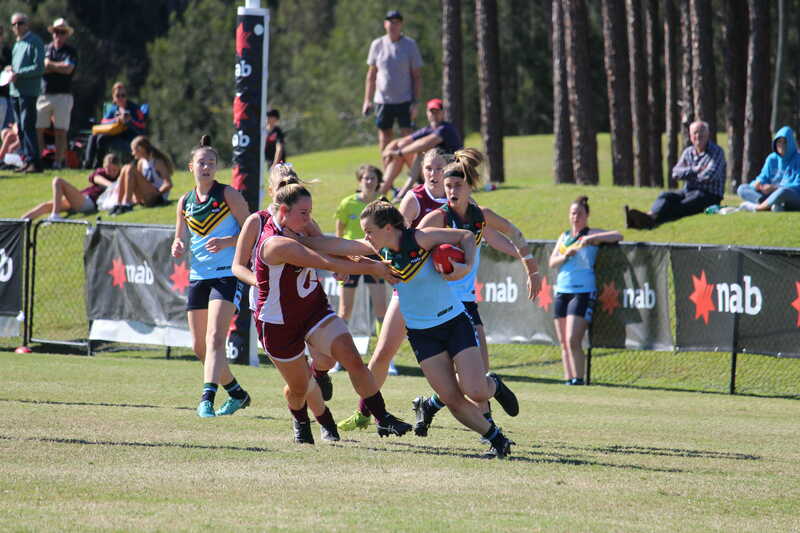 SOUTH Australia and Northern Territory’s top footballers will form the Central Allies in a formidable outfit for the AFL Women’s Under 18 Championships. In the first series, South Australia won both its clashes against Northern Territory, but the top-end talent in both sides is clear. We took a look at the side’s key players and its upcoming fixture ahead of round two of the National Championships on the Gold Coast. An unbelievable young talent who took out the SANFL Women’s Rising Star award after a terrific season. 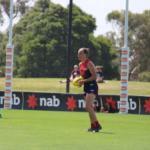 The 17 year-old South Adelaide midfielder was named in the best a massive seven times out of a possible nine for her side, five of which she was deemed to be in the best two players in the side. Considering her team won the premiership and had the likes of GWS GIANTS star Courtney Gum in the side, it was a massive achievement for Gore to standout and expect her to be a shining light for the Central Allies in the upcoming national carnival. Not surprisingly, she made the SANFL Statewide Super Women’s League Team of the Year. In what was not a surprise to anyone, Gore was named South Australia’s top player from the first series against Northern Territory. 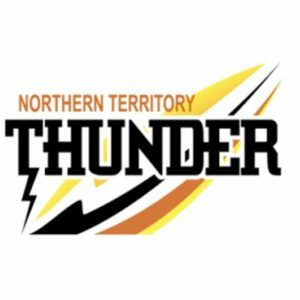 Also joined NT Thunder for the Victorian Football League (VFL) Women’s competition and made her debut on the weekend, booting a goal against Collingwood. Already shining in the VFL Women’s competition for Essendon, Ponter has become a reliable mid/forward who predominantly spends time at half-forward while pinching minutes through the middle at times. A member of the AFL Women’s Academy, Ponter is looking to carry over her good form from the Victorian state league to be a crucial key up forward for the Central Allies. She has represented Northern Territory on 11 occasions so far and has won the Sharyn Smith Medal (best and fairest) every year in the Youth Girls. Ponter has famous bloodlines being a niece of Essendon legend Michael Long. The dominant goal kicker in the side, Katelyn Rosenzweig is the fifth tallest player in the Central Allies squad, and uses her height to advantage in the forward line. Against Northern Territory, she was the main target, booting three goals in both games to cause all sorts of headaches. Now in an even stronger team, expect her to work well with Ponter in the forward half. At senior level in the SANFL Statewide Women’s League, Rosenzweig booted a massive 15 goals from 11 games, including bags of four (Sturt) and three (Glenelg and South Adelaide). It will take a good defender to stop her and she will be one of the contenders for leading goal kicker in the carnival next week. Like Gore, Baird is an NT Thunder player in the VFL Women’s, making her debut earlier in the season against Darebin Falcons where she recorded 11 disposals, two marks and laid six tackles. Her defensive pressure is a highlight of her game and one of the key Northern Territory players to watch. She has great speed and is an exciting youngster who is a December-born player meaning still plenty of development left in her. 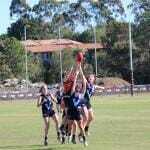 At 160cm, she will be a pocket rocket around the ground that opposition sides will need to watch. A standout for North Adelaide this season, Boles was voted captain of the Croweaters ahead of the two-game series with the Northern Territory. In the SANFL Statewide Super Women’s League, Boles booted eight goals in 11 games, including six goals across four matches, named in the best on a couple of occasions. She has been know in the South Australian youth girls system since booting three goals against Norwood in the Under 16s competition back in 2015. If there is one South Australian girl to keep an eye on for the 2020 National AFL Women’s draft, it is Abbie Ballard. 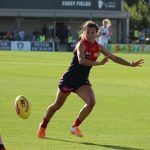 Before her 16th birthday, Ballard was already standing out in the SANFL Statewide Super Women’s League for West Adelaide, booting two goals in the final game of the season to be named best by her coaches. It was the fourth consecutive game she was named among the bests for West Adelaide, including two majors the week before. She might be the second youngest in the squad – born nine days earlier than fellow Croweater Teah Charlton – but she is expected to make a big contribution at the national carnival. 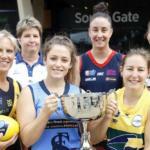 The vice-captain of the South Australian team played for Sturt in the SANFL Statewide Super Women’s League given her aligned club of Woodville-West Torrens were yet to have a side. She managed nine games with the Double Blues, named in the best on a couple of occasions and booting a goal. Her leadership will be important, as will her height in a side which is predominantly smaller – Dunstan is 168cm with 19 players below 165cm. In 2017, she played at the National Championships at half-back and is one of the better playmakers in the side, with impressive skills that hurt opposing sides. The first day will see the Central Allies take on fellow combined side Eastern Allies in a game they will go in confident they can win. The Eastern Allies have some serious top-end talent in Alyce Parker, as well as Chloe and Libby Haines, but the likes of Janet Baird and Abbie Ballard will look to counteract the taller side and use pace to run them off their legs. If they can control the ball through the midfield it gives their strong forward line a huge chance to kick a winning score on the big ground at Metricon Stadium. Heading over to Broadbeach, the game against Vic Country will prove to be a challenging one. The likes of Tyla Hanks, Nina Morrison and Olivia Purcell in the middle will always cause headaches for opposition sides, and the good defensive outfit will be touch to kick a score against. Danielle Ponter could find herself lining up against Emily Haeusler – a defender who’s strength is in her one-on-ones and is quick, while Katelyn Rosenzweig might find Lucy McEvoy wears her like a glove. To beat Vic Country, you just have to be smart with the ball and make the most of your opportunities. The final game of the week does not get any easier, with likely title favourites Vic Metro standing in the Central Allies’ way at Bond University. Madison Prespakis vs. Nikki Gore should be a thrilling midfield battle, while the Metro side is littered with class such as Georgia Patrikios up forward – who could well be a great head-to-head with Rachel Dunstan. The speed of Metro through Mikala Cann and Marnie Jarvis is sure to be a big consideration in team selection for the Central Allies, with perhaps Tabitha May and Janet Baird among those looking to cause havoc with speed the other way. NOW the AFLW is done and dusted, the AFL takes centre stage, while the TAC Cup and TAC Cup Girls competitions continue to throw up some sensational matches and moments. 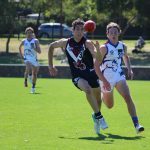 After the GWV Rebels blew a 20-point lead to lose by a point to Bendigo Pioneers in the first match of the season, they came out with a point to prove in round two. A jaw-dropping first half saw them pile on 10 goals to zero and leave the reigning premiers in their dust. They had a bigger fight in the second half, but held on strongly to record their opening win of the season on the back of some fantastic play throughout four quarters. There is no secret that Sandringham Dragons’ Max King is a player of interest this season, with one half of the King Twins plying his trade up forward as one of the most imposing key position players in the draft crop. He has battled with injury over the pre-season, and if anyone forgot what he is capable of, they need not look far. King booted 8.5 and took nine marks, six of which were contested, to single-handedly tear Oakleigh’s defence to shreds and send an ominous warning to the rest of the competition. Luckily for TAC Cup defenders, King will spend the majority of 2018 lining up for Haileybury. It took them a season and two matches to record their first win, but now they have the taste, they are not letting go. 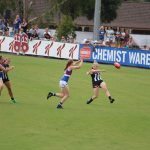 had it not been for a late Murray Bushrangers goal in round two, the Gippsland Power could have strung three wins together having lost their first six in the TAC Cup Girls competition. Since the first round, the Power have knocked off the Western Jets, drawn with the unbeaten Bushrangers, and taken down the Calder Cannons in a thriller. They face the Bendigo Pioneers this weekend and regardless of results, there is no question the development of the group has skyrocketed this year. Okay, so it might not be from the weekend, but the Courtney Gum story is a feel-good story that just keeps on getting better. The mature-age first-year player won the AFLW Players MVP Award, was announced All-Australian and finished on the podium in a host of other awards across the Players’ and W Awards nights. In a season where so many young players stood up and gave us a glimpse of the future, Gum reminded us that age is just a number and was one of the best talents throughout the entire 2018 AFLW season. They were criticised last year for not beating a top eight side despite making the finals, but it has not taken them long to stamp themselves as a potential premiership contender. Eyebrows were raised at times over the off-season with the recruitment of so many free agents, but the likes of Tom Rockliff, Jack Watts and Steven Motlop will only strengthen the Power and if their win over Sydney is anything to go by, we are set for an impressive season for the men at Alberton.